Harper, New York, NY. $27.99, hardcover, 512 pages, ISBN 978-0-06-170258-7 (2010). In Atlantic, Simon Winchester sets out to write a biography of the ocean. He has written biographies of people before, such as The Professor and the Madman, about the creation of the Oxford English Dictionary. Winchester’s extensive travels and training in geology have factored into many other nonfiction works and play into this book as well. A body of water as enormous and central to our lives as the Atlantic is a difficult entity to capture in one book, even if it is 512 pages long. So Winchester takes his organizing cue from the seven ages of man, as described by the character Jacques in Shakespeare’s As You Like It. He creates a chapter for each “age,” starting with the ocean’s origins and concluding with its geological demise. This book examines the relationship between the Atlantic Ocean and the people who live on or near its shores. The author finds that over time, people have feared, explored, revered, and then ignored the ocean. The regular replenishment of food sources in tide pools may have first drawn humans to settle near the ocean, in sea caves in South Africa, Winchester writes. He describes the efforts of early explorers, such as the first Europeans known to land in North America, at L’Anse aux Meadows, Newfoundland, 1000 years ago. He feels those Norsemen don’t get the recognition they deserve, and that Columbus’s accomplishments are overrated. Some sea battle history is included as well as graphic descriptions of the brutality of piracy and the slave trade. The section on commerce notes the importance and former abundance of cod and provides an overview of the whaling industry. The experience of immigrants sailing to North America is also portrayed. In another chapter, Winchester highlights how the Atlantic has influenced artists, writers, and architects over the centuries. He provides examples such as Winslow Homer, the American painter, and Joshua Slocum, author of Sailing Alone Around the World. The Atlantic’s ties to new technologies make for interesting reading. Regularly scheduled packet ships began to carry goods and mail across the ocean in the early 1800s. Many years of work went into laying the first transatlantic telegraph cable, to allow information to flow quickly from one side of the ocean to the other; consistent service was available beginning in 1866. These advances contributed to a growing sense of a global community. There seems to be an inverse relationship between our knowledge of the Atlantic and our respect for it, according to Winchester. He notes that we easily fly over it now, seeing it as more of a nuisance to get past. He describes the routine dumping of toxic materials into the Atlantic and the misguided notion that dilution is an effective solution. 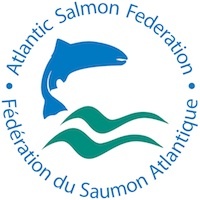 “The Atlantic, first to be found, to be crossed, and to be known, is by far the most polluted, the most plundered, the most disdained, the most dishonored of the world’s oceans,” he writes. Winchester tells his story of the Atlantic Ocean with a mix of history, science, and personal anecdotes. In the hands of a less gifted writer, this might have come out as a jumble, but I found the cherry-picked historical episodes entertaining and informative. The science sections are predominantly high level, so readers may not find much new there. Winchester engagingly describes some of his own experiences at various remote spots on the ocean. Overall, this may not be a comprehensive “biography” of the Atlantic, but it’s a good read nevertheless. 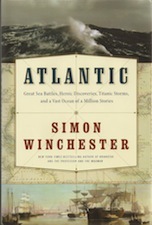 Simon Winchester’s own life is anchored by the Atlantic. He has lived on both sides of it: born and raised in England, he now resides in New York City and Massachusetts. This past July 4th, he was naturalized as a United States citizen. Fittingly, the ceremony took place aboard the historic USS Constitution in Boston Harbor.